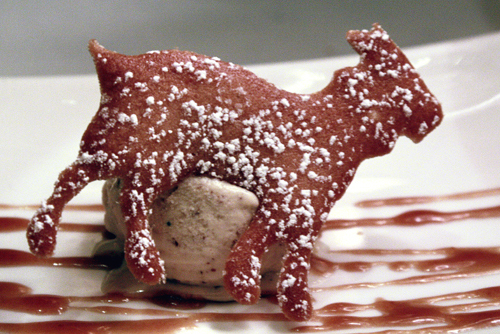 What do you get when you put two chefs together with three goats? The makings of a deliriously delicious evening. 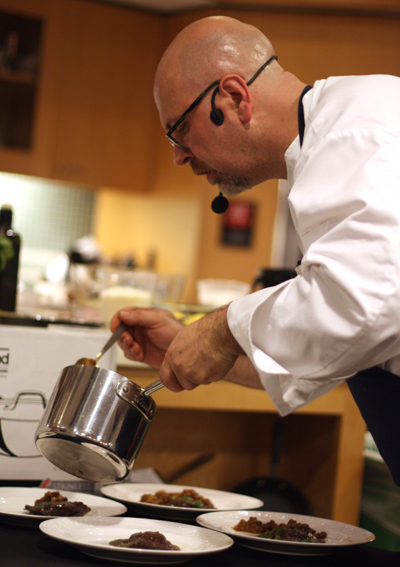 Such was the case last week at One Market restaurant in San Francisco, when resident Chef Mark Dommen invited Chef Staffan Terje of Perbacco in San Francisco to cook with him on a multi-course feast that was all about goat. The event was part of the “Dinner Party Project,” a series of dinners throughout July hosted by SF Chefs, the food and wine extravaganza that officially takes place July 30-Aug. 5. 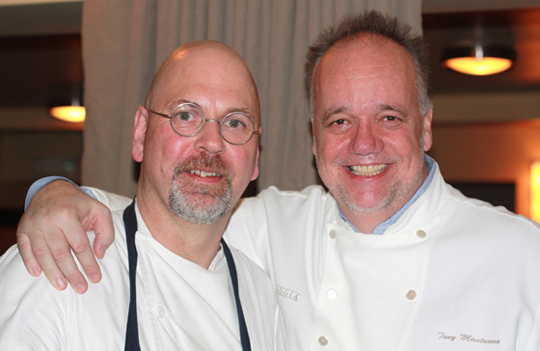 The dinners bring together two or more chefs to collaborate on a themed dinner. 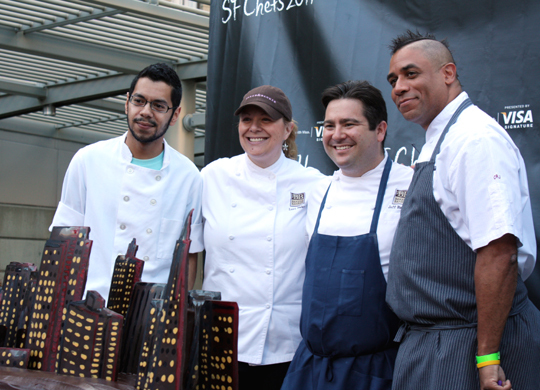 A portion of proceeds of each dinner benefits the Center for Urban Education and Sustainable Agriculture (CUESA), which operates the Ferry Building farmers market. 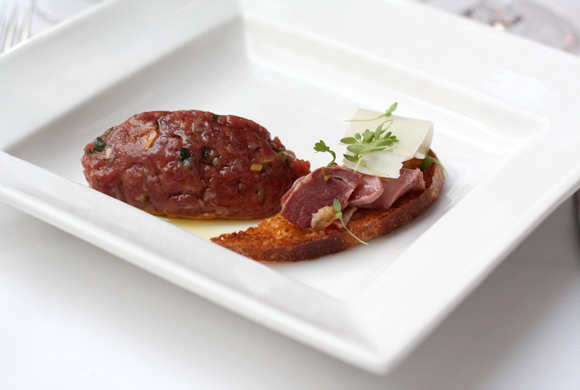 I was lucky enough to be invited as a guest to the dinner, which kicked off with Terje’s spectacular goat leg tartare. The mild red meat got a hit of crunch from diced celery heart, a pop of salinity from Cantabrian anchovy and floral acidity from preserved Meyer lemons. 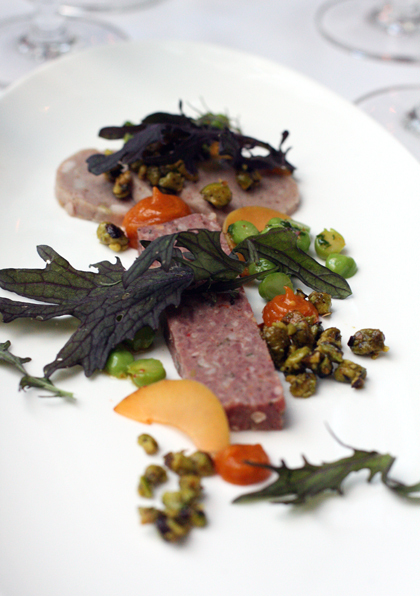 Dommen lobbed with goat liver terrine and goat mortadella with fresh apricots and apricot mustardo. It was the type of food that made you wish you were on a picnic in the south of France. 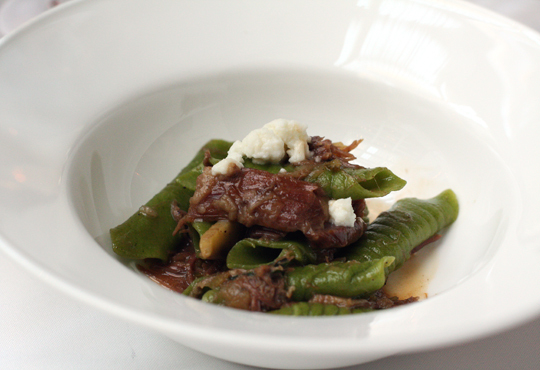 Terje never misses with pasta and his goat shoulder ragu over handmade, ridged garganelli pasta was sublime. The ragu was deeply flavored without being gut-busting heavy. Creamy, tangy goat’s curd was crumbled over the top. 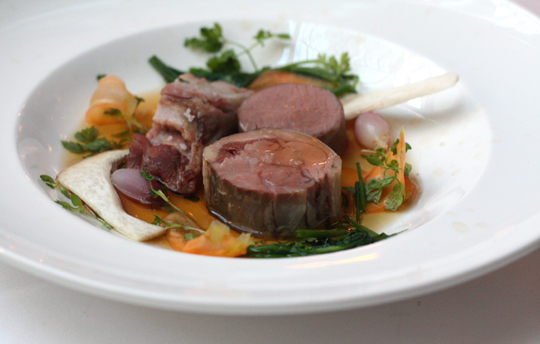 Dommen’s next dish was a riff on the classic pot au feu. 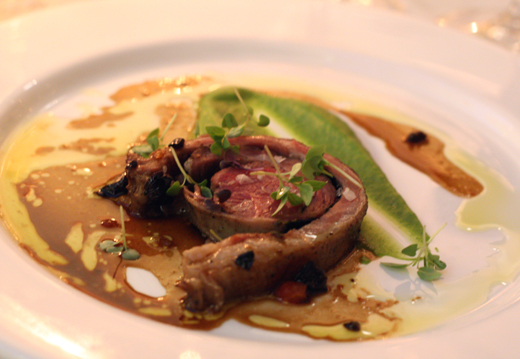 It featured neck, rib and loin, with its rich cooking liquid poured at the table to be lapped up by the spoonful. Terje’s “Goatetta” (a play on porchetta) was a spiral slice of loin and belly that had been slow-roasted until it was as tender as prime rib. 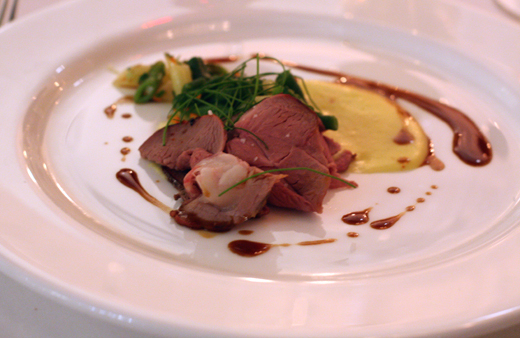 Next, spit-roasted goat leg, which Dommen had rubbed with espelette to add subtle smoky heat. The meat was tender, almost pastrami-like in texture. The accompanying corn puree was smooth, fluffy and so redolent of summer that I could have eaten an entire bowl of that alone. 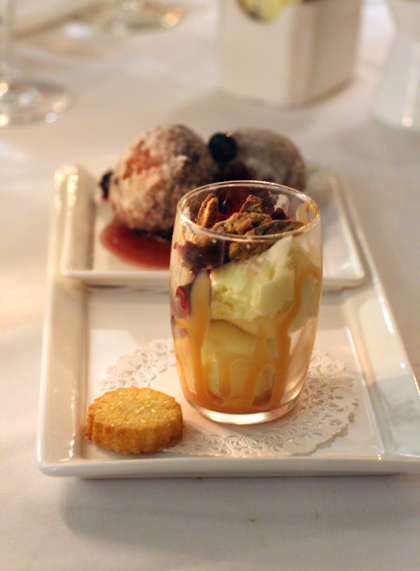 The goat theme didn’t stop with dessert, which was a duo of treats: airy ricotta doughnuts filled with goat’s milk jam; and goat cheese ice cream, at once tangy and savory, that starred in a mini sundae with Bing cherries, candied pecans and spiced goat’s milk caramel. * “Commonwealth and Crenn,” July 8 at Atelier Crenn in San Francisco. Dominique Crenn of Atelier Crenn will be joined by Jason Fox of Commonwealth in San Francisco for a a poetic, playful dinner highlighting California cuisine. General admission is $250. Visa Signature Card tickets are $240 each. * “Modern American Picnic,” July 9 at Baker & Banker in San Francisco. Lori Baker and Jeff Banker of Baker & Banker will team with Nick Balla and Courtney Burns of Bar Tartine in San Francisco for a dinner of updated homespun classics, including fried chicken. General admission is $135; Visa Signature tickets are $125. * “Family Night, Going Basque,” July 16 at the Grand Cafe in San Francisco. Chef Alicia Jenish of the Grand Cafe will be cooking with Chef Jen Biesty of Scala’s Bistro in San Francisco for a family-style Basque feast. General admission is $85; Visa Signature tickets are $75. * “Street Feast,” July 19 at Tacolicious in San Francisco. Executive Chef Antelmo Faria of Tacolicious will be joined by Ryan Farr of 4505 Meats and Alex Ong of Betelnut in San Francisco. Look for a whole pig to be roasted, and plenty of platters of Asian- and Mexican-inspired food. General admission is $95; Visa Signature tickets are $85.